I visited Town of Hvar for the first time two years ago in August. It was boiling hot, super busy and expensive. I remember telling myself to lay off those cocktails because they were quickly adding up. It’s a known fact that Hvar is 40% more expensive than the rest of Croatia and this isn’t just for tourists, locals suffer the consequences for the popularity of the island too. Why? Simply because they can, people will pay. Hvar is desirable, it’s a hot spot for the travel elite and well heeled, it’s one of the handful of places in Croatia who cater for this type of clientele with luxury hotels, villas, restaurants and party scene there for those who have the money to spend. Two years ago when I visited Hvar for the first time this is kind of what appealed to me. I had a friend from London finally give the ditch to his annual Ibiza trip and give Hvar a go. He paid over 2500€ for his villa per night, spent a week with his friends partying and island hopping around central Dalmatia, sending me declarations of love for my beautiful country and how he can’t believe he hasn’t visited sooner. Yes buddy, I know. His verdict? “Croatia is the first holiday I’ve had where I still have holiday money left over, this has never happened to me before.” Point being, for the super rich, Hvar is still relatively affordable and your money goes a lot further than it would in Ibiza or the South of France. Quite often when Town of Hvar is mentioned, it’s usually alongside celebrities, politicians and the Royal Family including Prince Harry who partied into the sunrise in 2011. It’s celebrity-friendly attitude has given public figures confidence to visit in peace with it’s paparazzi-free atmosphere. Given this celebrity approval comes a celebrity price tag, but is it really worth it? Town of Hvar does cater for every type of tourist from backpacker to those with deeper pockets. It’s also popular for young couples who are often seen dining by a candlelight. 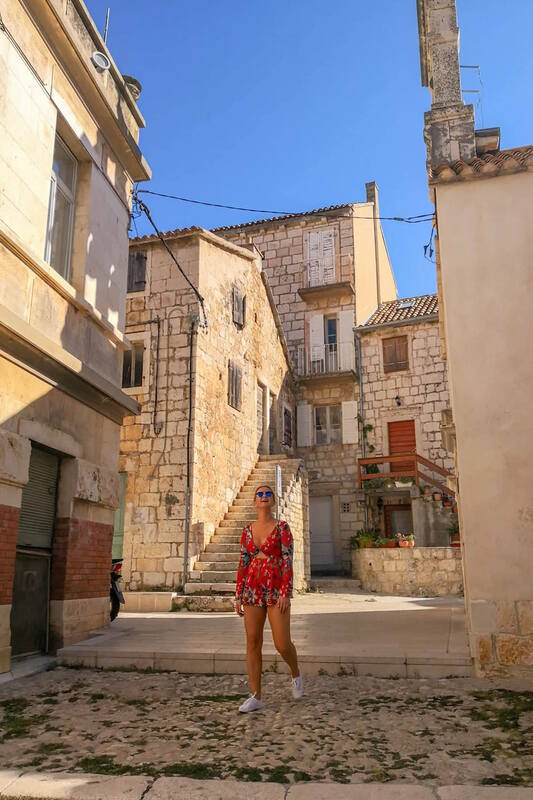 There are hostels and cheap bar crawls because regardless of the price, Hvar is to a town you should visit, it’s aesthetically beautiful and there is plenty to do and see. Even if you want to lay by the sea, Hvar has plenty of beaches and beach lounge bars. Hvar’s tourist season begins from the 1st May to end of October with busiest periods being July and August. The best times to visit as suggested by the Tourist Board is May and September, I’d say that this applies for anywhere on the Croatian coastline. We arrived to Town Hvar by water taxi from Palmižana, where we slept overnight and were greeted with blue skies and the warmth of the sun to match. As you can probably tell by this post’s feature photo, it didn’t take long for that to change and the bura to take over. 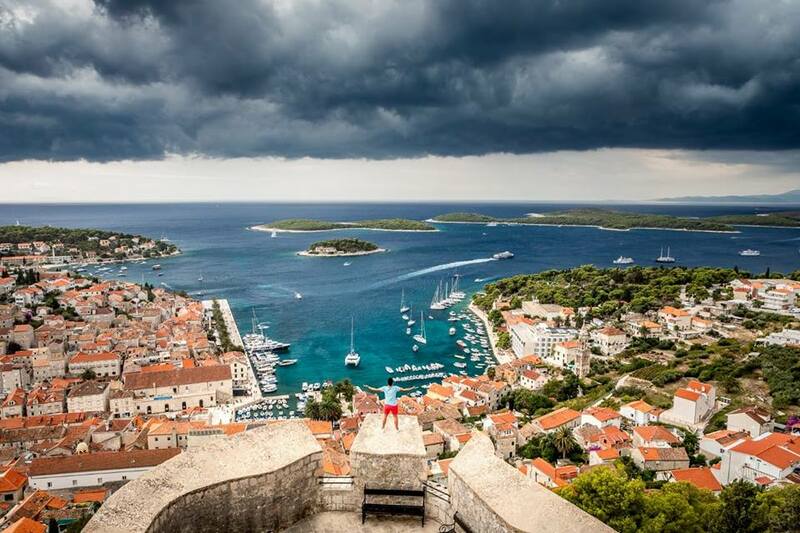 Lucky I took some shots of Town Hvar before the storm took over and ruined the show. One thing you’ll notice right away when you start wandering around in Town of Hvar on Hvar Island is the Venetian influence. This is my husband’s favourite type of architectural influence. The Venetians called Hvar home for almost 400 years at the beginning of the 15th Century, their dialect still visible in the language in modern day as it is full of old Italian words. The main square in Town of Hvar is the biggest open square in Dalmatia at 4,500m2. 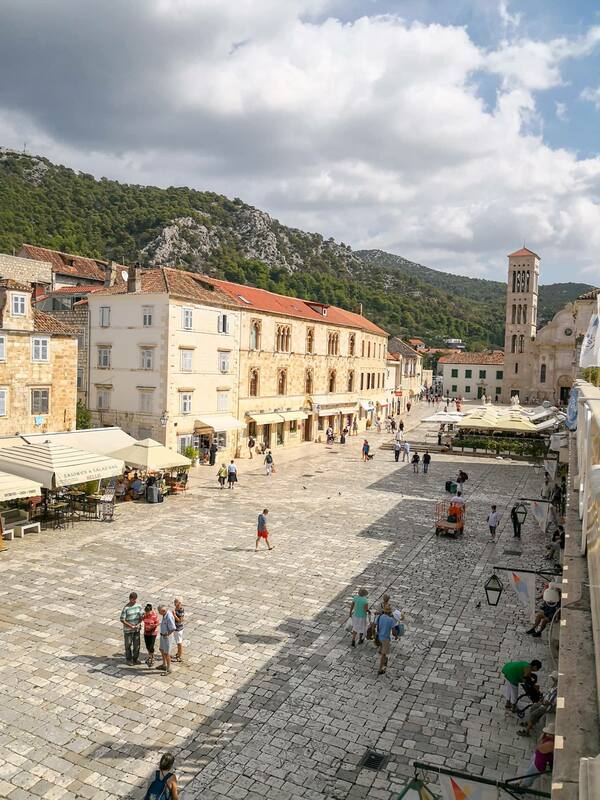 This square, like most in Croatia is like “the living room” of the town, often used for town gatherings, people watching from the cafes, it’s an overall the most social part of the town. Hvar is very strict in terms of how they expect their visitors to behave. I am sure there were a few too many rowdy bachelor parties in the past that rubbed the locals up the wrong way. Caught drinking and behaving disorderly in public? That’s a fine of 700€ in Hvar. Thinking of showing off your bikini bod while walking through Old Town? That will cost you 500€ or the equivalent of one month’s salary for the average Croatian. Hvar is beautiful and there to be enjoyed, respect the rules. For breath taking and uninterrupted views of Hvar and the Pakleni Islands, you must visit Fortica, also known as the Fort in Hvar. It’s visible from the Riva and there are two options to get up there. You can take a scenic walk which takes about 20minutes or you can go by car or taxi (costs about 100kn, which is a lot for Croatia so if you can walk, walk and save your money). On the day that we went, a storm was brewing and within an hour those blue skies were completely taken over by storm clouds and bura winds. By the time we got to Fortica, it was pretty grey. Entry to the Fort is 30kn for adults. After making our escape from the stormy Fort back down to the what looked like a ghost town, we had lunch at Restaurant Gariful. 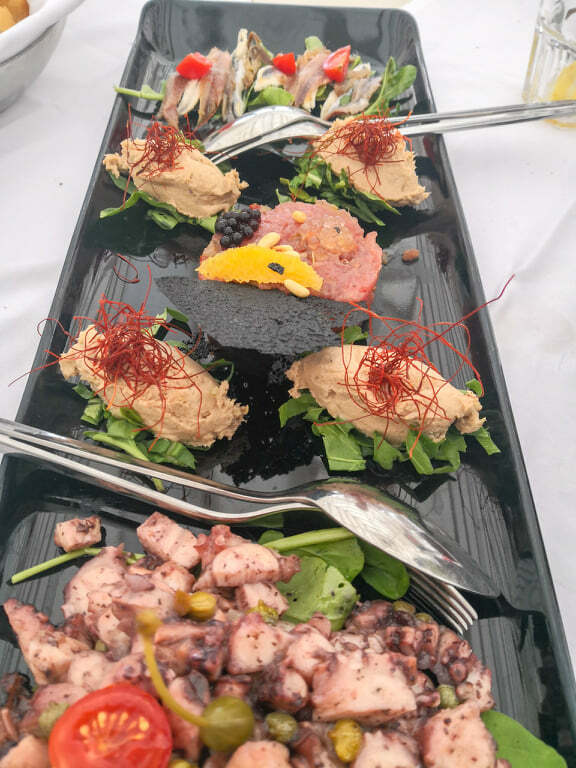 Gariful is an exclusive waterfront family owned restaurant on the Riva, literally where you get on and off the Jadrolinija in Hvar. You can’t miss it. 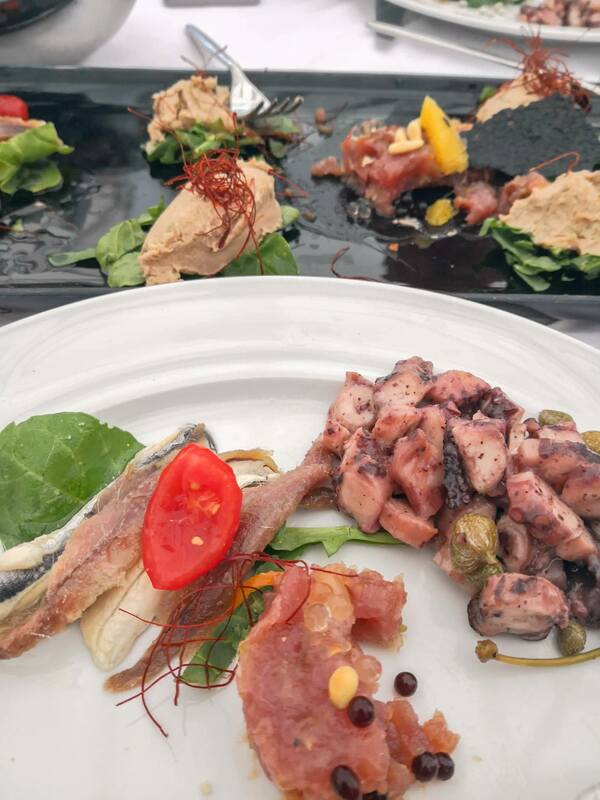 Their specialty is fish and they were not afraid to show us why they were known as one of the leading restaurants on the Island of Hvar. 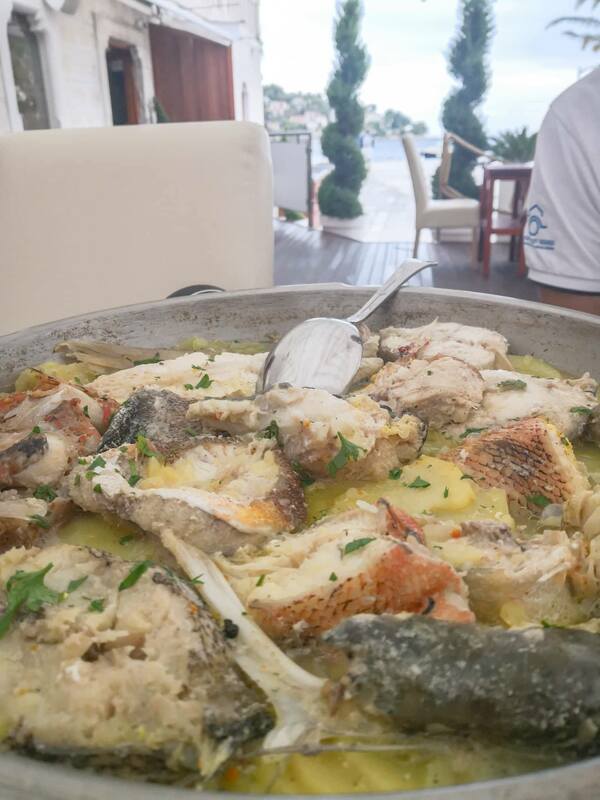 For main we had Hvar gregada, traditional fish stew made from premium quality white fish and top quality basic ingredients including olive oil, parsley, white wine, garlic, potatoes and onion. Would I ever think to order this if I saw it on the menu? Never, now I most certainly will. What are my final thoughts on Hvar? I do believe at some point in your life you should visit at least once, it’s special. This visit was very different to the one two years ago where I spent my days sipping cocktails in cabanas by the sea. 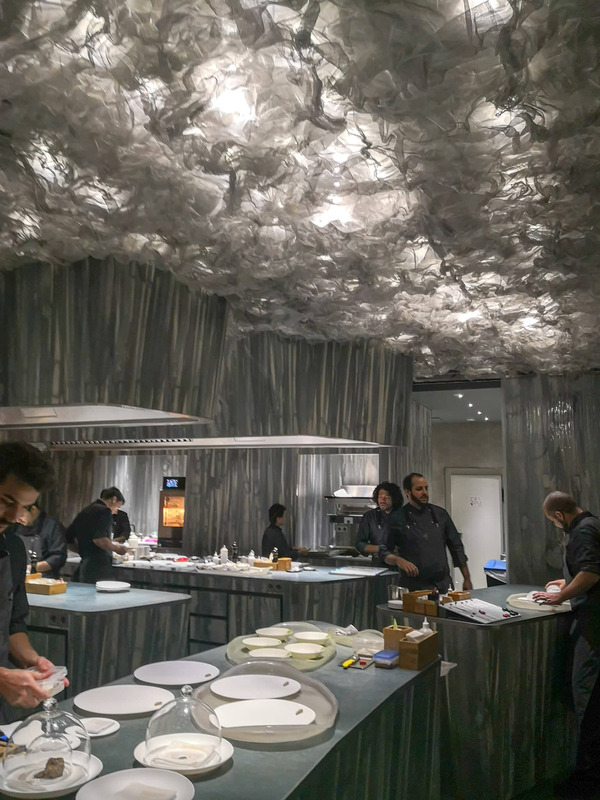 These days I am more interested in the gastro scene, doing walking tours… less lounging around and more walking around and getting familiar with my country and it’s history, something that Hvar has an abundance of.